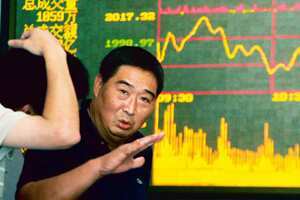 Hong Kong: Asian stock markets slid on Wednesday as a global rally eased amid continued fears of recession in the world’s biggest economies. Traders took their lead from a fall on Wall Street, which came despite a pledge by the US government to spend $250 billion (Rs12.1 trillion) shoring up banks to get money markets moving again. Hong Kong led the falls, shedding 5%, after two days of regional gains caused by the announcement of a global effort to put a stop to the worst financial crisis since the 1930s Great Depression. “All the good news has now come out," said Masatoshi Sato, a broker at Mizuho Investors Securities Co. Ltd. “Attention has now shifted to the real economy." However, Tokyo managed to edge up more than 1% a day after its record 14% surge. As dealers took profits following the advances of Monday and Tuesday, Sydney slid 0.8%, Taipei lost 0.86%, Seoul shed 2% and Shanghai too was off 1.12%. Singapore lost 3.24%. “We had a couple of good days and it’s not surprising to see some profit-taking," said Nomura Australia Ltd markets strategist Eric Betts. The fall in Hong Kong came despite the government saying it would guarantee all bank deposits in the city for the next two years. But despite the general concern for the world economy, there was enough confidence in Tokyo that the central bank drained the money markets of ¥2.8 trillion (Rs1.55 trillion) after 19 straight days of pumping in money. Stocks took their cue from Wall Street, where the Dow Jones Industrial Average retreated 0.82% on Tuesday to 9,310.99, shedding early gains. On Monday, the index registered its biggest points rise in history and its biggest rally in percentage terms since 1933. Meanwhile, Janet Yellen, the head of the San Francisco branch of the US Federal Reserve, said the US economy appeared to already be in a recession, usually defined as at least two quarters of economic contraction. Her comments came after Washington announced its package to help the banking industry. Nine large banks including Citigroup Inc., JPMorgan Chase and Co. and Goldman Sachs Group Inc. agreed to give the government equity stakes in exchange for new capital, under the plan. While panic selling on global markets has subsided for now, there are still deep concerns about the outlook for the US and global economies. “The US government’s bailout plan is not going to get the economy back on its feet anytime soon," warned analysts at Calyon Bank (Credit Agricole CIB). “Markets will increasingly brace for a long and deep recession in the US and a recession to varying degrees globally." Elsewhere in Asia, Manila closed 1.55% lower, Wellington was 1.5% down, Kuala Lumpur was 1.7% off, and Jakarta ended 2.3% off.